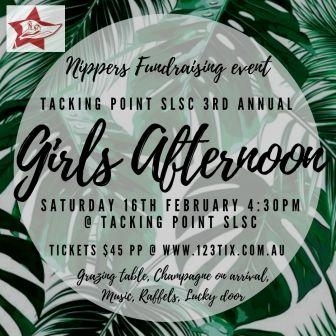 Join us on Saturday 16 February for a fun filled afternoon of bubbles, food and music at the Tacking Point Surfclub! You'll be treated to a glass of champagne on arrival , luscious grazing table, live music by Simon Gudgeon & plenty of chances to win prizes, so dont forget to bring some extra coins to play along! Tickets are $45 per person and available now! All funds raised go directly to the purchase of much needed nipper boards for the kids. Its going to be an afternoon you dont want to miss! Unless required by law tickets are not refundable. All bookings and ticket purchases are transferable by you. Entry may be refused if tickets are not purchased from an authorised seller.